You never know what will turn up in the book shops along Avenida Corrientes in Buenos Aires. Besides the new books, there are old, out of print books, used books and overstocks that failed to find buyers. 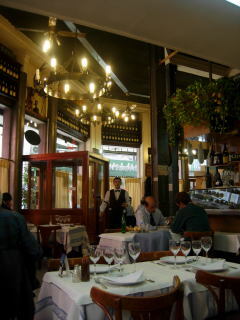 On this last trip I turned up a real prize, “Los Platos de Mi Mesa” (“Dishes from my Table”) by a restaurateur of the past, Roberto Fernandez Beyro. 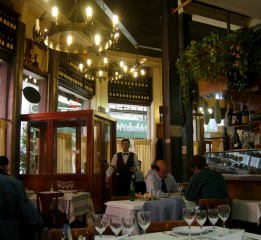 In addition to owning a popular restaurant in Buenos Aires called Monty’s, now long gone, Fernandez Beyro had managed the kitchens of the exclusive Jockey Club and Plaza Hotel and for a time had a restaurant in Rio de Janeiro. His antidote was this book of simple, well thought out recipes, mostly continental, but also traditional and international. I tried his curry de pollo (chicken curry) and found it delightful, even elegan t. Showing a restrained continental approach, it's more like braised chicken and vegetables seasoned with curry powder than a spicy Indian dish. Fernandez Beyro served the curry with rice timbales on what must have been lovely occasions. There would have been wine too, because he was an admirer of the wines produced in Argentina. My accompaniments were basmati rice seasoned with a yellow condiment for rice that I bought in a supermarket in Buenos Aires; a fruity chutney and a red wine, as Fernandez Beyro recommended reds with chicken. On the basis of just this dish, I can say that my 10 pesos (about $3) were well spent. Trim the chicken pieces of skin and excess fat. Place in a Dutch oven. Cover with water and add salt to taste. Bring to a boil, cover and simmer until tender, about 45 minutes. Let cool in the broth, then remove the chicken pieces and tear off the meat, discarding the bones. Drain the broth and reserve. 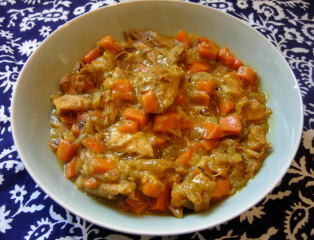 Meanwhile, prepare the onion, celery, carrots, apple and chile and set aside. Blend the curry powder with 3 tablespoons of the reserved broth after it has cooled. Heat the olive oil in the cleaned Dutch oven. Add the vegetables, apple and chile and cook until reduced and very tender, 20 to 25 minutes, stirring occasionally to keep from burning. Add the flour, 1 cup of the reserved broth and the curry powder mixture. Blend well. Add the chicken pieces and gently combine. Add salt and pepper to taste. Cover and simmer gently 10 minutes. When ready to serve, stir in the cream and heat through. 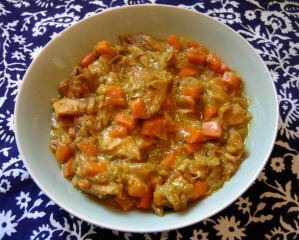 If the curry should thicken too much, stir in some of the reserved broth. Use the remainder to cook rice to go with the curry. The vacation is over, and I'm ready to start posting again. Buenos Aires was wonderful, as always. It was my seventh trip there, and my love for this elegant city never diminishes. Yes, prices have gone up but are still affordable. However, rising food costs and scarcities are worrying locals, who are buying up dollars, fearing that the peso might be devalued again. 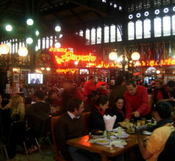 A flight over the snow-topped Andes brought me to Santiago, where I spent eight days immersed in Chilean food, wine and history. 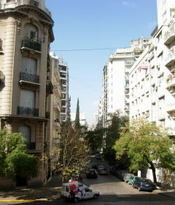 Santiago is quieter, more laid back than vibrant Buenos Aires. Broad open areas, tree-lined streets and views of the Andes made walking about a pleasure. An excellent subway system took me everywhere I wanted to go. In upcoming posts, you'll learn how to hop onto that subway and hop off at a winery. You'll join me for an exquisite, four-hour lunch at Santiago's Astrid & Gaston; read about a rare, golden wine nurtured by the Andes; visit charming Barrio Lastarria; have lunch at an oldtime confiteria where a president once dined; eat fresh abalone at a seafood market, attend a sumptuous buffet, and ride the funiculars of Valparaiso. 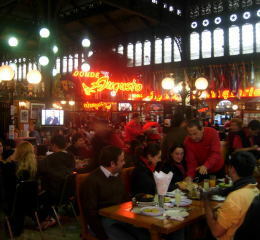 What was the best dish I had in Buenos Aires? You'll be surprised when you learn what, and where, it was. You'll spend a day with me in historic cafes; visit my favorite Italian restaurant, where Francisco, the waiter, is ready to greet you too; experience a menu of food from Salta province paired with wines from Cafayate; eat pizza at a couple of famous places and wonder, as I do, why people like to drink wine from penguin decanters. 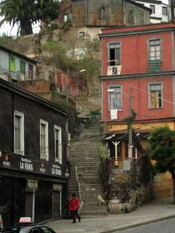 From top to bottom, a view from La Isla, an upscale residential neighborhood in Buenos Aires that houses the British embassy; El Establo, a grill restaurant in central Buenos Aires; eating seafood in Santiago's Mercado Central; a street scene in Valparaiso. 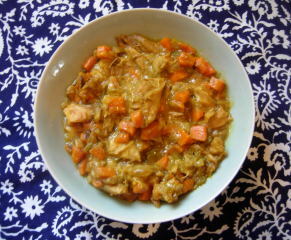 Next post: From Buenos Aires, a recipe for chicken curry from a celebrated culinary figure of the past.